It’s with great pride that we celebrate an incredibly successful Ultimate Tailgate Party, 2014! Your support raised over $135,000! 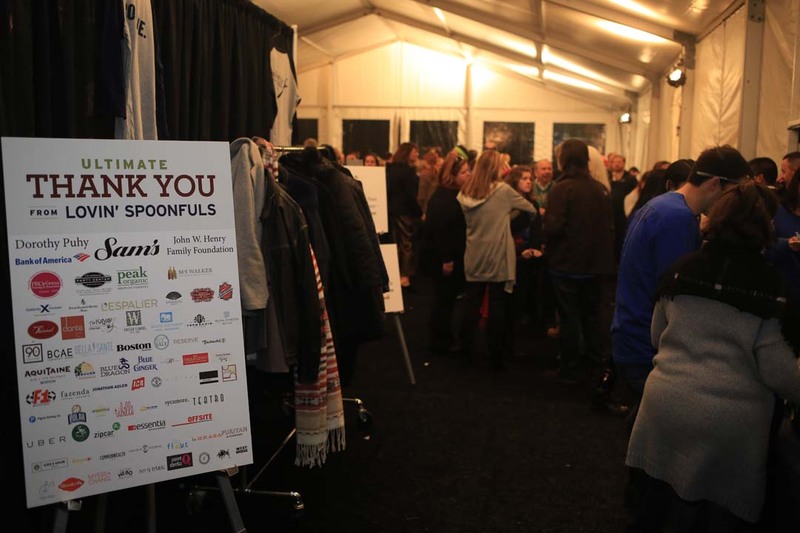 We welcomed over 300 on the waterfront at Sam’s, and gathered in a gorgeous tent with incredible music, fabulous food, one of a kind auction items and the ‘Swoon Booth‘! Dorothy Puhy, The John W. Henry Family Foundation, Bank of America, Peterson Party Center, Winston Flowers, MS Walker, ProForma, and Peak Organic all sponsored our event with generosity, enthusiasm and cheer. Our volunteers were amazing and spirited – we thank you all. 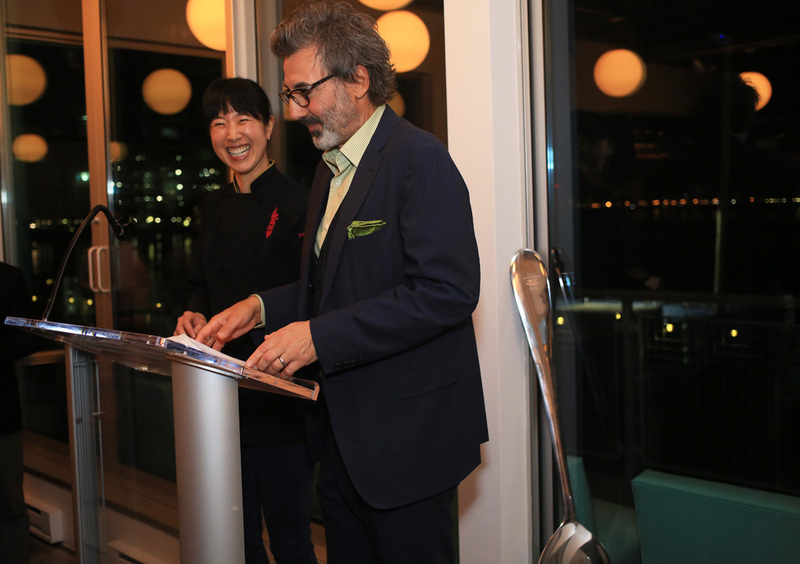 During the sold-out VIP celebration upstairs at Sam’s, we were proud to present the first ever, Thomas M. Menino Award for Service – to legendary restaurateurs, and founding members of our esteemed Culinary Panel – Christopher Myers and Joanne Chang. Josh Smith of Moody’s & New England Charcuterie, along with the fabulous Wasik brothers feted VIP guests with an incredible spread of specialty cheeses and charcuterie. MS Walker outfitted our entire event with bubbles from Simonnet-Febvre, and selections from MSW’s own private label wines, Harbor Town & inspired. Downstairs in the tent, Offsite was shaking incredible Ward 8 cocktails, and serving up a crowd favorite – Negronis on tap. Peak Organic was our featured brewery, not only pouring delicious seasonal brews, but their co-Founder Rob Lucente, also emceed our evening’s program – raising over $30,000 during the live auction! Lovin’ Spoonfuls is fortunate to have had the support of the restaurant community from day one- but looking around the tent, I was overcome with pride…20 of the most amazing and generous chefs in our city, came out to support our work and fed our guests – which in turn, keeps us on the road and feeding our community. It’s no secret that chefs and restauranteurs are the unsung heroes of charity – any event, any ’cause’ – these folks are the first to always say yes. And here at LS, we are so proud to be supported by so many incredible people. Longtime supporters Louis DiBiccari, Will Gilson, Asia Mei, Karen Akunowicz, Colin Lynch and Christine & Carla Palotta were back on hand with amazing dishes. We were thrilled to welcome Tiffani Faison, Matthew Gaudet, Steve ‘Nookie” Postal, Daniel Bojorquez (who previewed La Brasa last year! ), Mei Mei Street Kitchen, Jason Cheek, Keith Pooler & Jason Albus. And of course, we were proud to have our remarkable Culinary Panel represented – Joanne Chang, Christopher Myers, Jamie Bissonnette & Michael Scelfo. My deepest thanks to Joe Fallon, Esti + Drew Parsons, TJ Connelly, and to our good friends Marjorie Clapprood and Chris Spinazzola – for their time, support and creative vision for this year’s Tailgate! We had a blast working with everyone, and are proud to have the support of this incredible community. Each truck we put on the road rescues 250,000 lbs of fresh, healthy food each year – and we keep them on the road with your support. This event raised over $135,000 for our work – and we are truly grateful. Follow along on Instagram, Twitter & Facebook as we post photos from the party in the coming days. If you couldn’t attend, or would like to support our work and learn more about what we do and why, visit us here.